It's been a while since we published a review of a Rockport Technologies loudspeaker. Michael Fremer raved about Rockport's Antares in August 2002, which at the time cost $41,500/pair. In September 2004, he was also impressed by the combination of the Rockport Merak II loudspeaker and Sheritan II subwoofer ($29,500/system). I've been consistently impressed by the sound of Rockport speakers at audio shows over the past few years, so I asked Rockport's Andy Payor for a pair of Avior IIs. 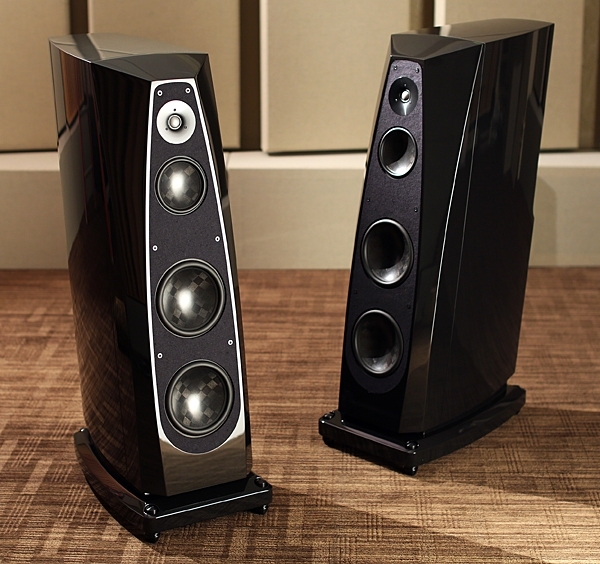 At $38,500/pair, this three-way design is almost identically priced to the Magico S5 Mk.II and is very similar in height, width, and weighta back-breaking 220 lbsbut is significantly deeper. The review samples were finished in a high-gloss piano black, and the speakers' appearance belied their bulk. Other than on the stepped rear panel, there's hardly a straight line to be seen: the top slopes down, the sidewalls are gently curved, and the sloped-back, 6"-thick front baffle is faced with inset black felt and narrows toward the top, to optimize the tweeter's acoustic environment. The raked-back enclosure is heavily braced and features a triple-laminated, constrained-mode-damped construction with sections of varying thickness, and stands on an integral base, which has a subcompartment for the potted crossover circuitry. The network is wired point to point, and uses film/foil capacitors manufactured exclusively for Rockport Technologies as well as custom inductors and Caddock power resistors. All the crossover components are matched to within 1% tolerance, and each individual network is fine-tuned for the specific drive-units with which it will be used. Those drive-units? Starting at the bottom of the baffle, the twin 9" woofers are reflex-loaded with a flared port approximately 8" deep and almost 3" in diameter on the rear panel. Above the woofers is a 6" midrange unit that covers the range from 150Hz to 2kHz. At the top of the baffle is a custom 1" beryllium-dome tweeter from Scan-Speak, housed within a shallow catenary waveguide. According to Andy Payor in an e-mail, this waveguide "improves the acoustic impedance match of the tweeter at the low end of its range, and allows for lower distortion and greater dynamic expression from the tweeter itself, as well as improved dispersion characteristics at the midrange/tweeter crossover point. "Back in the 1950s, Harry Olsen showed the effects that different enclosure shapes have on the baffle step, as well as edge diffraction. Both of these phenomena can be mitigated with a large chamfer or radius on the enclosure's edge. However, the small ¾" radius or chamfer that you typically see on an enclosure doesn't begin to solve the problem. In order to be effective, these chamfers need to be much broader surfaces, more like large facets, to significantly affect diffraction issues. The Avior II's large, broad baffle facets do an excellent job of making the transition from 2pi to 4pi space much smoother. The baffle step still exists, but the transition is less problematic. "The other issue that the broad chamfer helps solve is edge diffraction, where the soundwaves move across the baffle and encounter a sharp discontinuity at the cabinet's edge and the wave essentially 'snaps' off the baffle and creates a new, secondary source of sound. This new source of sound is slightly disparate from the driver's original direct radiation and of course combines with the original radiation to create a whole host of comb-filtering artifacts and phase anomalies. Enclosures that don't address edge diffraction or the baffle step never really get entirely out of the way sonically, and draw attention to themselves during playback." The lower-frequency drivers in Rockport's previous generation of speakers, including the Antares and Merak, used Audiotechnology motors mated to Rockport's carbon-fiber composite cones. The original Avior, introduced in 2011, was the first loudspeaker to use a midrange drive-unit and woofers designed from the ground up by Rockport Technologies. 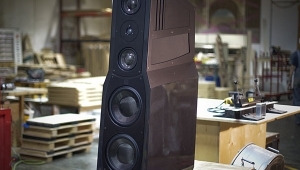 According to Payor, "I felt it was extremely important to have full control over every aspect of the drive-unit's design and construction in order to elevate the performance potential of our loudspeakers beyond what is possible using off-the-shelf drive units. That's not to say that there aren't plenty of excellent drive-units available for purchase, but I can say with confidence that none are like the ones we build, and these are not merely another manufacturer's drivers with our dust caps on them." "When we began building our own custom midrange and bass units about six years ago, we changed to titanium formers because they are considerably stiffer than the Kapton formers we previously used. I prefer not to use aluminum formers because of the unwanted eddy-current damping (aluminum is a very good electrical conductor). On the other hand, titanium's electrical conductivity is quite low, so we can avoid the eddy-current damping (as with the Kapton formers), yet still benefit from much better transfer of force to the cone, as well as better thermal dissipation. Our motor systems utilize optimized copper shorting rings and tapered pole pieces, and have generous, radiused venting through the motor system." I was somewhat taken aback when the Avior IIs were delivered. Each was packed in a large, well-finished crate that only just fit in the vestibule to my listening room. (Though the crate is narrow enough to fit through a standard doorway, the fact that the vestibule's door to the street is not in line with the door to my room left just ½" of clearance!) Casey McKee, of Austin dealer Ne Plus Ultra, visited to help me unpack the Aviors and set them up. I was always under the impression that the specified frequency response of a loudspeaker is under anechoic conditions. Here the specified -3db point is 25Hz but the anechoic mesurements shows -10 dB at 25Hz w.r.t. 100Hz. Apparently the manufacturer has considered 7dB of room gain. To the reviewers, is there any industry standard of room gain amount to be added to the measured anechoic (/quasi-) measurements of a speaker, Or any standard room size based on which they draw their -3dB response? Secondly, regarding the rising low frequency in your anechoic measurements due to stated artifact of nearfield measurement techniques, what would be the order of the error that your readers may safely assume? Hello JA, it was mentioned that some colloration could be noticed on some piano recording that was reproduced in a real listening room. I was quite anxious to see in the measurements plot the reasons for that, but only a suspect of the ressonance in the side pannels was commented to be a possible cause. However, in the frequency response in the JA room (figure 6), I could notice some peaks and valleys between 500-800Hz and on 2.5-3.0KHz. Could they be indications for these collorations? Unfortunately you can't measure coloration, than regarding the room response curve you are looking, is normal to see this peaks and valley in every room and can't be considered as an instrument to evaluate a loudspeaker because the changes from one room to another are huge. Andy has the crossover point between the midrange and woofer fairly low. A higher crossover point at around 250hz to 350hz to would somewhat side-step the floor bounce cancellation in the lower-midrange we see in the measurements. In fact, this design is no different from a pair of standmount speakers with a pair of passive subs underneath. And how much does it cost again?